If you would like our assistance in installation of the Google Certified Shops Magento Extension and setup of the Google Certified Shop account, please contact us. Google has rolled out a new service in the UK called Certified Shops, which aims to increase confidence for new shoppers. Although still in its pilot phase, the fact that Google is turning it’s attention to confidence building measures suggests there is a need for it within the e-commerce market. But what does it do? The Google Certified Shops is a free programme designed to increase confidence in shoppers who visit your e-commerce store. As long as you are meeting specific requirements, Google allows merchants to participate in the Google Certified Shops programme. 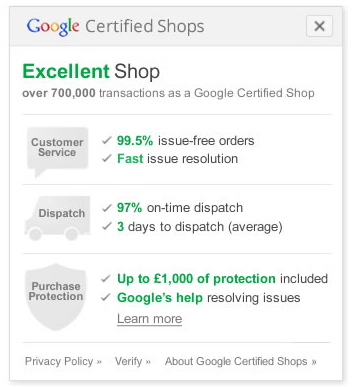 Google provides you with a Google Certified Shops badge to display on your website to show customers that you are meeting the requirements set. Users who click on the badge will be able to see performance metrics for your e-commerce store such as deliveries dispatched on time & issue-free orders. The belief is that having this rating from Google – a highly trusted authority – will increase the conversion rates on your e-commerce store as customers will be more confident in purchasing from you. While this is a safe bet to make, check back over the coming months as we are currently conducting a case study into Google Certified Shops to find what impact having a Google Certified Shop badge has. Google is offering free purchase protection to customers who order from certified shops. The customer will need to opt into the purchase protection during checkout, however there is no charge for this service and it has no impact on the customer checkout journey. If the customer opts in for purchase protection and there’s an eligible issue with your order which they cannot resolved, the merchant or the customer can request Google’s help in resolving the dispute. Although Google allows you show star rating on your PPC adverts and search results already, it is hoped that the data from Certified Shops could automatically feed into these ratings. In the US, their Trusted Stores programme already does this, so it is safe to assume that this isn’t far away for UK merchants. How to become a Google Certified Shop? 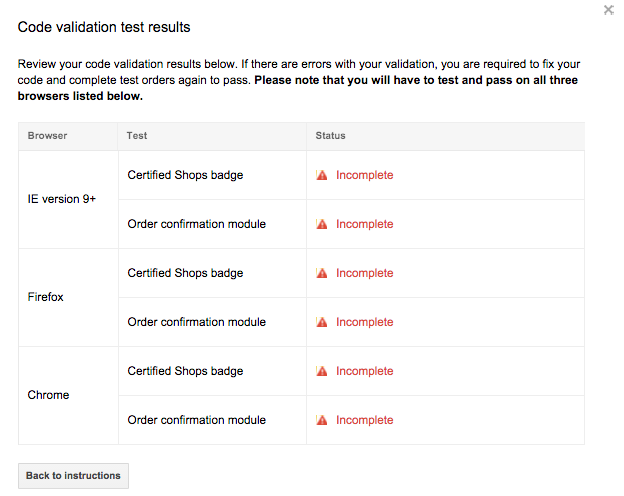 To become a Google Certified Shop, you need to meet minimum requirements set by Google. To show you are meeting these requirements, you will need to feed specific data to Google, including: order data, products available for sale, your customer service and return policies, the end-to-end shopping experience at your store, and your marketplace sellers and policies. 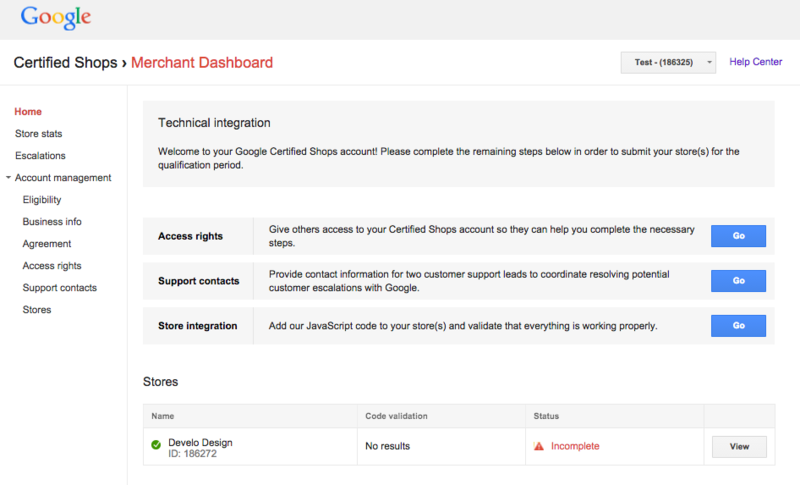 The Google Certified Shops Magento extension is a simple integration tool for Magento that feeds through the required information to Google for meeting the criterion to become a Certified Shop. The extension and installation guide is available at the extension’s Github repository. Before you setup the extension, you will need to register for a Google Certified Store account. You will be required to enter information about your store and sign agreements, which is a very straightforward process (see screenshot below). Once you have completed the information for your store, you will land on the technical integration page. To complete this section, you will need to setup the extension in Magento. 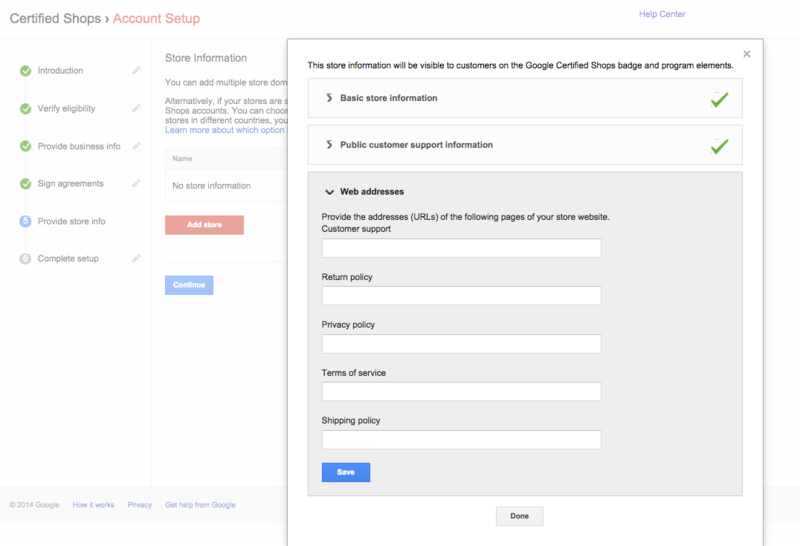 Enter your Store ID – you will be provided with this when you register for a Google Certified Store account. 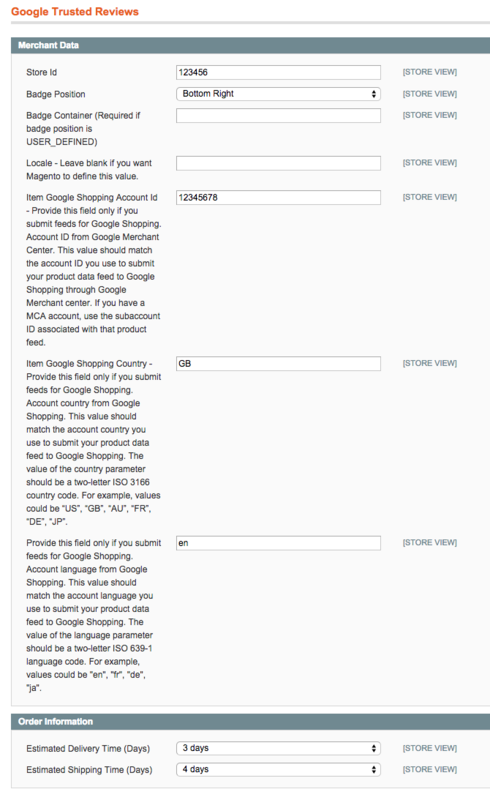 If you submit feeds to Google Shopping, enter the account ID, country code and language code into the relevant fields. If you have completed the above instructions, all these sections will show as either ‘passed’, or ‘passed with warnings’. Close out of the pop-up window to return to the store integration page. You will now be able to submit your store for qualification.